When it comes to collecting sports books, numbers rule the roost, or to be exact, statistics. From the very start of organised sport, people have wanted to know just who did what, where, and how often. Hence, the sports statistician was born. Since cricket, in particular, is a sport of numbers, it’s no surprise that it spawned the first commercially-produced sporting almanac. 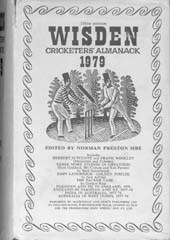 Wisden, the bible of the summer game, was first issued in 1864. By that time the publication of cricket statistics was already well established in annuals such as Haygarth’s Scores and Biographies, which had reported on the game since the eighteenth century (copies of these still come to light, and in specialist cricket sales they fetch prices of £100 to £250). Thomas Wisden was a well-known Victorian cricketer who played for Sussex between 1845 and 1863. He also turned out for the United England xi and toured North America with an All England Team; these were the forerunners of today’s test teams. Small of stature, Wisden was primarily a bowler. In 1850, playing for North versus South at Leamington, he took all ten wickets. As a batsman, he made centuries against both Kent and Yorkshire. However, it is through the Almanack, with its distinctive yellow dust jackets, that we remember his name to this day. It is popular with sports collectors, and prices for the scarcer issues reflect the popularity – anyone thinking of putting a complete set together had better have very deep pockets indeed. At time of writing, for example, the 1916 edition is available on ABE for the princely sum of £3240. The reason for this particularly high price? Three of the giants of the early game had died during the previous year and the 1916 edition includes the obituaries of W.G. Grace, C.B. Fry and Victor Trumper. It’s also worth bearing in mind that Wisdens issued during the second world war appeared in relatively short print runs because of paper shortages, and so fetch higher prices. In 2003, Wisden embraced a new image:gone from the cover are the two top-hatted ‘gentleman’ cricketers, and in their place is a photograph of England opening batsman Michael Vaughan. From now on a different player will be featured each year. The ensuing discussion and letters to The Times about this departure from tradition gave Wisden the kind of publicity you can’t buy. Mind you, the revolution was not as total as outraged conservatives made out. To mollify died-in-the-wool traditionalists, the publishers actually printed extra dust jackets with the traditional cover, to be ordered separately. The serried ranks of yellow spines will still look as they always have. A number of attempts have been made to topple Wisden from its position. All have failed. However, a few contenders have found a place in the market. Of these, the Playfair Cricket Annual is the longest established, and 1950s editions of this pocket-size almanac sell for about £50. Sadly, Scotland’s own statistical annual, originally published under the sponsorship of outfitting retailer R.W. Forsyth and in more recent times by investment advisers M.M. Main, was scrapped by the Scottish Cricket Union two years ago. It is to be hoped that the recent success of the Scottish Saltires in the national league will encourage them to think again and resume publication.